. . . and then you argue interminably over which history to believe. When I was a child, my parents had a small bookcase in our den. Neither of my parents were readers when I was growing up, the books in the case were an odd conglomeration they’d picked up over the years; perhaps they thought they added character to the den. There were old textbooks, Reader’s Digest Condensed Books, some Zane Grey given to my dad by a friend because he liked westerns, some old best-sellers that didn’t stand the test of time. The Reader’s Digest Condensed Book for the spring of 1960 (Volume 41) contained The Haunting of Hill House by Shirley Jackson, a book that scared the bejeebers out of me as a child and still gives me chills today. The textbooks were vintage 1920s-era that had belonged to aunts and uncles. They contained some real NC-17 rated gems, like a hair-raising prose version of Beowulf (complete with hair-raising pictures of the bodies of Grendel’s victims scattered about the Great Hall of Heorot and of Beowulf ripping off Grendel’s arm). There was also a memorable story by Victor Hugo titled A Fight With a Cannon wherein we come to appreciate the meaning of the term “loose cannon” and heroism is rewarded and negligence punished in a single stroke. But the book I spent the most time with was a volume of historic images from American history. There was a picture of an event on each page with a very concise caption providing the only context for the image. I didn’t understand a lot of what I was seeing. There were pictures of men in funny costumes with strange hair standing around tables and signing pieces of paper. There were pictures of old-fashioned soldiers standing stiffly in long rows shooting at each other. These images were easily explained by the captions. But some images contained tantalizing hints of deeper mysteries. 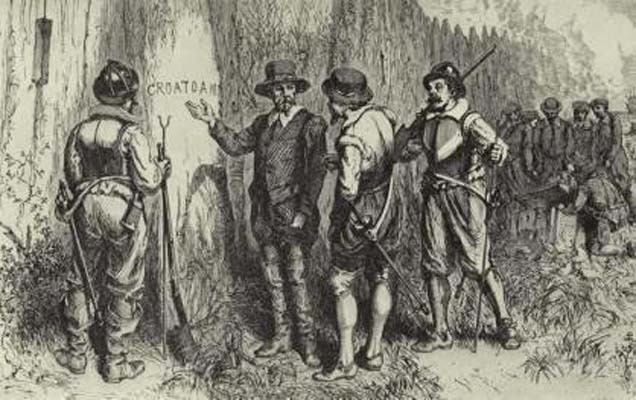 I remember an etching of several men in antiquated armor carrying matchlock muskets, standing in front of a ruined stockade, gazing in perplexity at the word “CROATOAN” carved into a post. 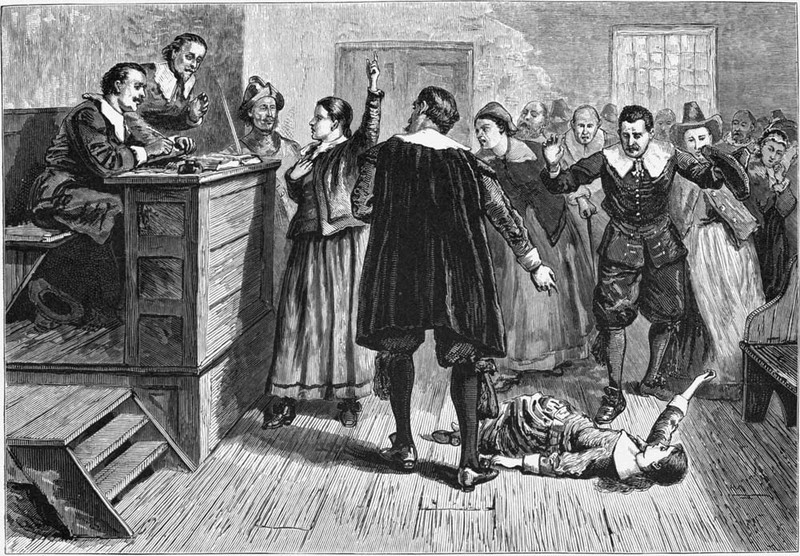 I remember a picture of a little girl writhing on a floor in front of a judge’s bench as men and women looked on in horror. But one of the most indelible images showed a mass of US soldiers and Indians locked in a struggle to the death on a hilltop. Obviously, there was no one in the cavalry, scout or soldier, who could definitively say what actually happened here in those last few minutes: who was standing where and who was doing what. But at least Paxson had input from people who had survived the experience, the Indians. The contemporary soldiers presumably got the cavalry equipment and uniforms right. Based on accounts of the Indian participants, the one thing missing from this composition is soldiers trying to surrender and being cut down where they stood. Not that I hold that against the Indians; if these guys had just shot up the village containing my wife and children, I wouldn’t have been inclined to grant them “King’s X” just because they ran out of ammo. 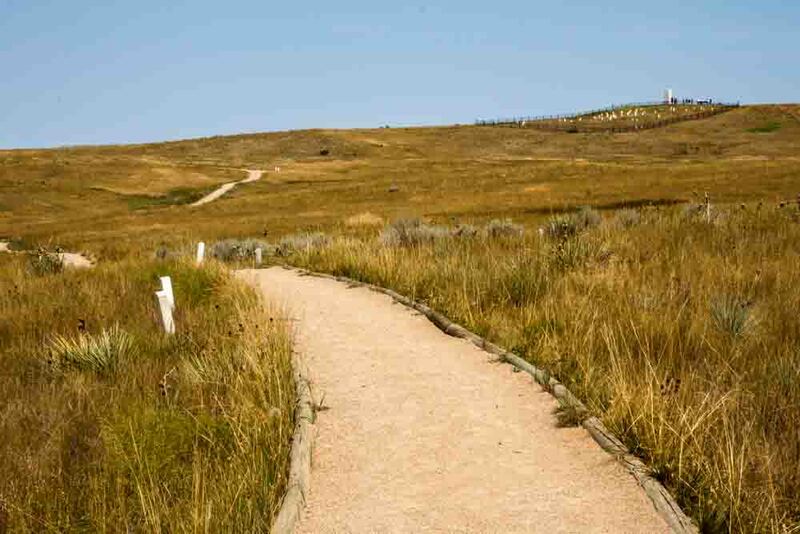 At any rate, a visit to the Little Bighorn battlefield was something I’d always wanted to do and our route to the Black Hills lent itself to this. Soon we were staying in an RV campground visible from Reno Hill. The markers on Last Stand Hill represent where soldiers of the 7th Cavalry were found after the battle. Only a few of the officers are named, most of the markers just say “U. S. SOLDIER 7TH CAVALRY FELL HERE.” The markers are not headstones. The troopers, those whose bodies were not retrieved and reburied by their families, are buried in a common grave underneath the monument at the top of the hill. This is (I believe) the only battlefield in the world where the distribution of the bodies was marked. The bodies of the Indians were retrieved after the battle by their families but some red granite markers are now being placed where they fell. In the eighties a wildfire cleared much of the area and archaeologists with metal detectors did a survey. There’s still a surprising amount of controversy over the findings. The archaeology seemed to suggest that the traditional Last Stand wasn’t the actual last stand and that a group of soldiers broke away from the command group at the top of the hill and fled in panic toward the river where they were overwhelmed. Much has been made of Custer’s questionable leadership and moral character as well as the poor qualities of the troopers of the 7th Cavalry. The implication seems to be that they were unfit to win the confrontation on the Greasy Grass. On Reno Hill ,three miles away from the Last Stand, the remainder of the 7th under Reno and Benteen held off the Sioux until General Terry’s column appeared the next day. They had no cover, no water. What were the differences between “Last Stand Hill” and Reno Hill? Were the soldiers there braver than the soldiers with Custer? Were they better led? No, the differences were ammunition and time. Custer’s men had 24 pistol rounds and 50 rifle rounds with 50 more rifle bullets in reserve on their horses, many of which were run off before their riders could get to the ammo they were carrying. Benteen and Reno had plenty of ammunition because Benteen had been joined by the pack train before he met Reno on the hill. And Reno and Benteen’s men had time to get into skirmish positions before they were hit by the main body of Indians. 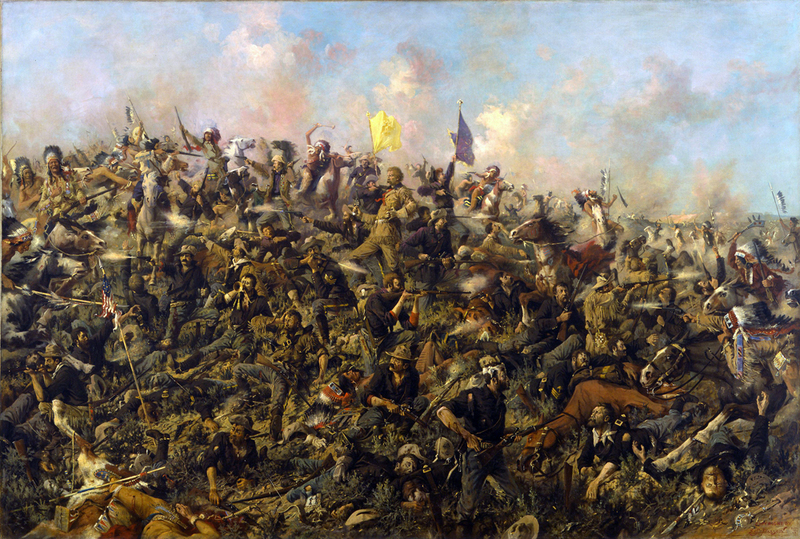 Custer’s troops were too widely scattered to support each other in the time they had left. They tried to cut off the Indian’s retreat and discovered that the Indians weren’t retreating this time. I’ve spent a lot of time thinking about the old “the victors write the history” wheeze. That hasn’t been literally true since monumental stone was the only medium for recording history. Opposing views have been written about pretty much any significant historical event. Certainly everybody is writing history these days, winners, losers, and crazy people alike. The question is, are we exposed to any contrasting viewpoints? In the United States, the history we learn in public school is controlled by the school boards who determine what’s in the textbooks the students see, and the school boards are influenced by popular culture’s current take on whatever the subject is. We went to the battlefield the day we arrived (the 12th of August) and stayed until it closed, then spent the entire next day there. We listened to the Crow National Park Service Ranger give his battlefield talk. 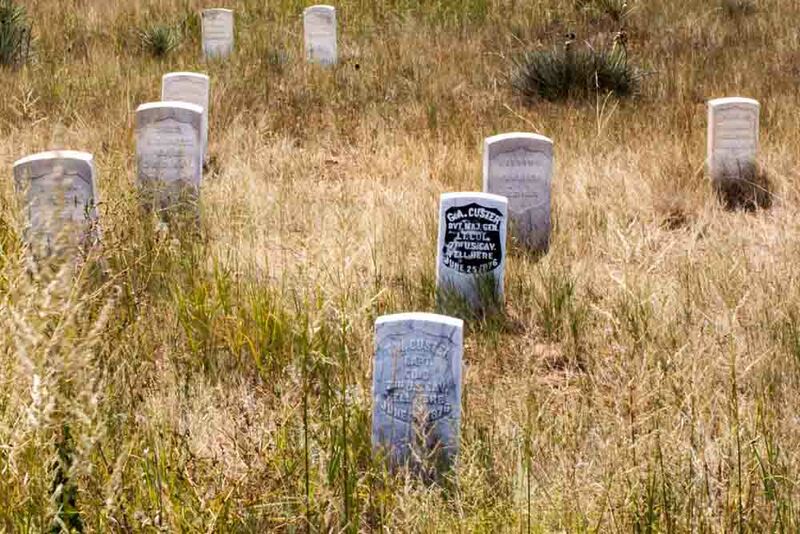 We went on a driving tour of the battlefield and listened to the Crow tour guides make jokes about how much they enjoy seeing Custer die three times every year during the annual re-enactments. They described the soldiers and officers of the 7th in a light that made them look like The Evil Yet Pathetic Three Stooges, I got really tired of all the the smarmy “Yep, Custer was an idiot/moron/fool” pronouncements made by tourists who didn’t seem to realize they were getting all of their opinions from people with a less-than-objective viewpoint of the Great Sioux War of 1876 and its aftermath. Not to say the Crow aren’t justified in their viewpoint or that Custer didn’t make mistakes, but the tourists were getting a really superficial view of a complex topic. Anyway, as reflected in popular culture, we’ve got multiple versions of history to cope with. This is a problem, but not an insurmountable one, we don’t stop with the first version of history we encounter. I realize it’s impossible to review every version of every historical event ever, but if a particular subject interests us, we can’t stop with the version of the story we: a.) learned in school, b.) heard from a friend/polemicist/guy at a bar/relative over Thanksgiving Diner, c.) read in a book, d.) (shudder) saw in a movie, or e.) heard from a tour guide. We absolutely must explore different viewpoints, as many as possible. The more opposite the viewpoints, the better. And a cautionary note: if one side is depicted as purely noble and completely justified in their actions (as both sides in this conflict have been depicted over the years), we need to look deeper. Where the Battle of the Little Bighorn is concerned, we have our usual two main viewpoints, losers and winners. But we also have two ways to look at the “winners.” The Sioux and their allies won the battle but lost the war, so they’re winners in the short run but losers in the long run. 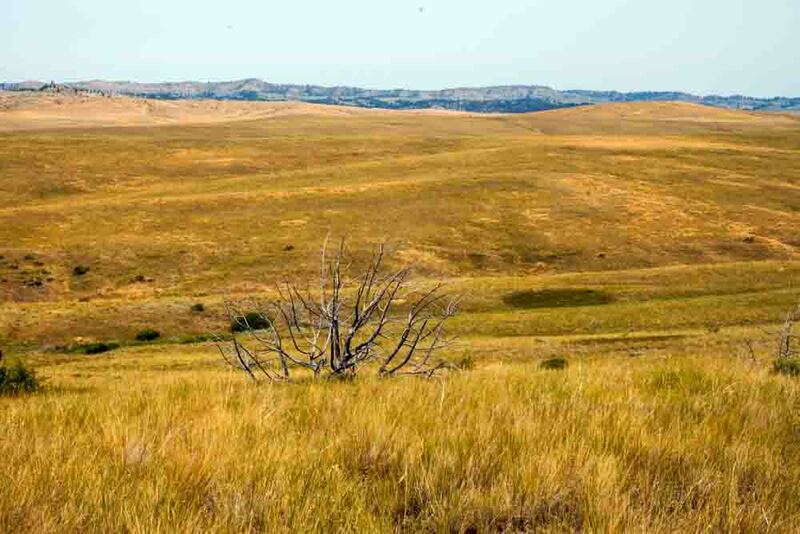 Shortly after the battle, the Sioux were forced off their “ancestral” lands and their sacred Black Hills. But whose “ancestral lands” were they? The Sioux had only been in possession of the Black Hills for about 100 years; they forced the Cheyenne out (ironically enough) around 1776. The Cheyenne had only been in the Black Hills since they pushed the Crow and Kiowa out in the early 1700s. The Kiowa had migrated to the Black Hills around 1650 and lived peacefully with the Crow who had migrated there earlier, presumably either assimilating or dispossessing whoever was there at the time. Wikipedia states that the Black Hills have been inhabited since at least 7000 BC. The Arikara were the first mentioned, having arrived by 1500 AD. I don’t know who was there before them. What we do know about the historical “ownership” of the Black Hills is that they were possessed by anybody who wanted them and was strong enough to take them from the previous occupants. 137 years after the battle, what can we say unequivocally? 1.) the Europeans wanted the Black Hills in 1876 just as the Sioux had in 1776, and, 2.) the Sioux failed to prevent the Europeans from taking the Black Hills in 1876, just as the Cheyenne failed to prevent the Sioux from taking the Black Hills in 1776. But the Crow rangers and guides were the only people I heard telling the stories at the Little Bighorn National Monument. The Crow fought on the same side as the US Cavalry in 1876, not because they loved the US government, but because they hated the Sioux and Cheyenne. But I think over the years, many Crow have come to identify with the Sioux and Cheyenne, the side that won the battle but lost the war. 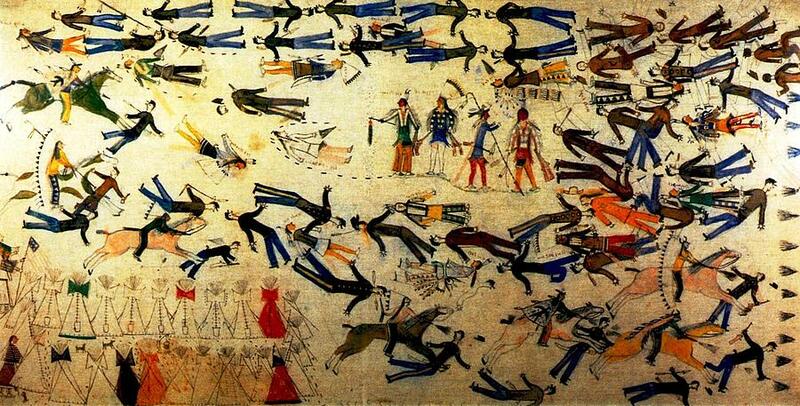 So at the Little Bighorn, even though everybody is writing the history, only the losers are telling their side. At this remove, “Whose fault was it?” is a game for children. The European occupation of the Western Hemisphere was as inevitable as a boulder rolling downhill. Forget “manifest destiny” and “we were here first,” this was the culmination of the Steel Age meeting the Stone Age. There was no way the Stone Age was going to come up even. Well written and I agree! But it seems we always root for the underdog.